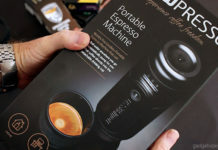 Home Gadgets Nanopresso Review – A Portable Espresso Machine with 18 bars! 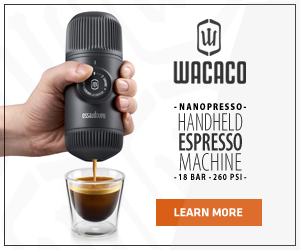 Wacaco just seriously raised the 'Bar' with their next generation Manual Espresso Coffee Maker! Update – Guys, I’ve just reviewed the Nanopresso with the Barista Kit. If you’re considering buying the Nanopresso, then I highly recommend you also grab yourself one, it’s a serious upgrade! Here’s my video review for those that would like to see it in action. A review and demonstration of the Nanopresso, a portable espresso maker from Wacaco. Lighter, smaller, easier to pump and yet twice as powerful as its predecessor (the Minipresso). The Nanopresso is set to take outdoor espresso coffee making to the next level. I have five portable espresso machines, the Nanopresso is undoubtedly my favourite and the one I’d recommend. I’m a huge fan of manual espresso machines. I’d say 80% of all the coffee I drink is extracted from a portable coffee maker. My passion started with the Aeropress which isn’t actually an espresso machine, but it still makes a damn fine coffee. Up until getting my hands on the Nanopresso, I’ve been switching back and forth between the Handpresso and the Staresso. My experience with these other devices has given me a strong understanding of the intricacies of dialling in a perfect coffee extraction. Armed with this knowledge, I’m confident I can get the best out of the Nanopresso and I hope you find this review and demonstration helpful. The Nanopresso comes in a good quality retail box. Inside you’ll find a detailed user guide, a warranty card, and a couple of stickers. The user manual is extremely well illustrated. 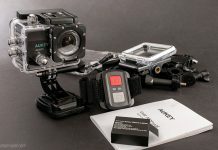 It includes a detailed step-by-step guide, tips for getting the best results, a troubleshooting section along with details on the cleaning process. It’s very simple to follow and printed in a total of nine languages. Unlike most portable coffee machines, the Nanopresso comes with a top quality hard carry case as standard. The Handpresso has its own similar case, but it’s actually an extra $25.00 on top of the cost of the product. If you intend to use the Nanopresso on your travels, this case will come in super handy. 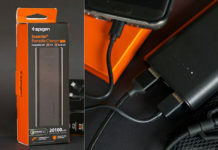 It’s lightweight and moulded perfectly to house the device without taking up hardly any additional space. I’m struggling to describe just how impressed I was handling the Nanopresso for the first time. I don’t want this to sound like a sales pitch, but trust me when I say it’s practically flawless in its design and build quality. Its capsule shape is a delight to hold and the deep knurled top and bottom provide the perfect grip when tightening and loosening the components. With your thumb and forefinger comfortably resting against the raised edge of the pump it really could not be easier, even with wet hands. Despite the Nanopresso’s body and components being made from plastic, it somehow feels very robust and solid. That being said, it still comes in at just 333 grams (11.7oz) on my scales. Weight may not be a huge factor for most people, but if you’re into hiking as I am, every gram counts. In comparison, the Handresso’s weight comes in at almost 500 grams. When you disassemble the Nanopresso for the first time, you’ll find seven individual components. 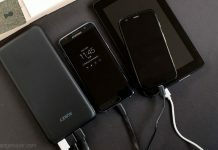 Only four of these are essential to the device. Those being the Portafilter, coffee basket, the main body and the water tank. Additionally, there’s also a coffee scoop and cleaning brush, they both fit neatly into the water tank. The Nanopresso also cleverly comes with an Espresso cup that clips securely to the underside. Each item fits together with absolute precision. As hard as I try, I simply cannot find fault in any individual part. Components that require durability, such as the filter basket, are thick and robust. I have absolutely no doubt that you could bash coffee pucks out of the basket all day long without damaging it. There has clearly been a substantial amount of thought given to the Nanopresso’s design. The water tank requires less than a quarter of a turn to tighten and is impossible to cross thread. As for the portafilter, it screws on so cleanly, it almost causes ASMR tingles up the back of my neck, I kid you not! Anyway, all of this design and build goodness is irrelevant if the extraction is not up to scratch, so let’s take a look, shall we? I’ll briefly explain the process here, as I’ve already demonstrated it on my Youtube video. Measure 8 grams of coffee and add it to the filter basket. If you’re using the scoop, it’s pretty much level with the top. Use the scoop to tamp the coffee into the basket and make sure it’s nice and tidy. The manual suggests a hard tamp, this will be dependant on how fine your grind is. (optional) Preheat all components using boiling water. Drop the basket inside the Nanopresso and tighten on the portafilter. Discard the water (assuming you didn’t skip the preheating phase) and add fresh water to the tank. Make sure it’s no higher than the maximum line (80ml). Now carefully tighten it to the base. Twist the pump anti-clockwise to release it from the chamber. Turn the Nanopresso upside down and begin pumping the piston once every second. 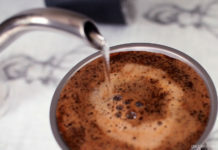 Continue pumping until you’ve extracted your preferred quantity of espresso. I started with the exact same setting on my Hario Mill that I use for my other portable espresso machines and made my first Nanopresso coffee. In front of me was a delicious espresso. It was full of flavour and detail, with a good temperature and an impressive looking crema. Over the last few days, I’ve been experimenting with the grind and I’ve taken it from one extreme to the other. Too fine and the Nanopresso will slow drip during the extraction, too coarse and the flow will be excessive. There is a fairly large window for adjustment, so you should have no trouble finding your own sweet spot. In a perfect scenario, you’ll have a freshly roasted bag of beans at hand along with a suitable grinder. This is not always the case. I have tried three different pre-ground coffees and they all have worked well with the Nanoresso. For those that need an even easier preparation method, Wacaco have released an NS Adapter. This will allow you to drop a Nespresso capsule inside the portafilter instead of using the filter basket. There’s also a Barista kit to give you a double shot of 16 grams and a larger water capacity of 120ml. I have absolutely no doubt that the Nanopresso will be my portable espresso machine of choice. 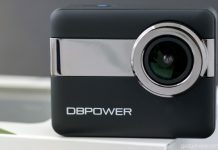 It’s lighter, smaller, yet more powerful than my others devices. The piston is as quiet as a mouse and a pleasure to use. 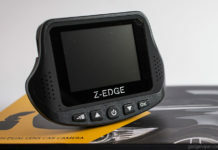 The build quality is precise and all elements of the design seem spot on. The integrated espresso cup and the hard carry case make it ideal for travel or for using outdoors. Most importantly, it makes an amazing espresso coffee. The Nanopresso Portable Espresso machine is well designed and has a fantastic build quality. It outputs up to 18 bar of pressure for a genuinely high-quality espresso. With the upcoming Barista and Nespresso pod adapter, the Nanopresso is set to become the leading portable espresso machine on the market. I’m looking for a portable espresso machine when I found your reviews. It seams that you really recommended the Nanopresso. I was close to buy the Handpresso because I read a lot of reviews saying that the Handpresso makes the best coffee. But nobody compared the Handpresso with the Nanopresso. I would be happy if you could compare them. I am really in doubt about them. Personally, I prefere ground coffee or Nespresso pods instead of E.S.E coffee. You opinion could be help me a lot in my choice. Thanks a lot and I hope you understand my English, I from Brazil. Thanks for the great review on this product. After your recommendations I decided to buy one! For now I just bought the standard Nanopresso. My question: can you make an americano or cappuccino with the standard version of this product? It seems possible I guess, they may be a bit smaller then normal but okay… I fancy myself an americano or cappuccino after some time. Hi, Simon. Thank you for your videos and reviews. I liked them very much. I became the proud owner of Nanopresso and must say this machine made an impression not only on me, but also on my friends and even on a professional Barista. After three attempts, together with the Barista, we made such a decent espresso, which makes the machine for 10 thousand dollars, standing aside. And everyone who tasted the coffee was shocked. While I have no Barista Kit, but single espresso is perfect with 35-40 ml of water. Of course, it all depends on what coffee you fill in the machine. Nespresso capsules are good, but after a good ground coffee they are already suitable only for hiking. I wish you more ideas for the video and good luck! If you get a chance, treat yourself to the Barista kit, it makes a double-shot espresso just as good as the single. Have a great day! I`ve just ordered my BaristaKit. Can`t wait to recieve it and take my hands on it. I received my Nanopresso and Barista Kit recently and it really extract excellent espresso! With 8g filter basket (single shot), I manage to extract around 30ml of espresso with about 28seconds with 50ml of water. But with 16g filter basket (double shot), I need around 50 seconds to extract 50ml of espresso with 80ml of water. Is this normal? Should double shot basket (16g) take approximately same extraction time compared to single shot (8g)? Hi Edmund, The double shot should not take that long to extract if your finished drink has a 50ml (50g) weight. My extraction takes around 25-27 seconds. My Nanopresso giveaway video has a good example of a double shot extraction. To improve the extraction speed, I’d suggest using slightly fewer grinds and a lighter tamp. If that doesn’t help, then try a slightly coarser grind. I’d definitely try and get that time down to 30 seconds max. – Hope that helps, have a great day! Just got this as a gift, eager now to try it. Your demo was great! Thanks! I used a 1Presso Mini Grinder adjusted for finer than indicated by 1Presso for espresso. Dark roast. Preheated with boiling water. Here’s the odd thing….possibly: It does NOT matter if I tamp “moderately hard”, leave room for the porta filer to finish tamping as you suggested, or tamp VERY hard…. the stream seems ideal: Steady and strong while pumping, with no dripping. Since not overextracted, the coffee does not have a bitter taste. I guess it’s not what am I doing wrong. It’s what am I doing right- in as much as the expected fiddling with grind, tamping, quantity, etc seems unnecessary. I’m one of those who, if I can’t go too far (to cause brewing problems), I’m afraid I haven’t gone far enough (to get the best quality). Should I be grateful, let well enough alone? Or depressurize to see what happens, try an even finer grind, or….? Once I learn “where the edge is”, I will start using the Barrista Kit, also bought strictly on your recommendation. Hi Bob, Sounds like it’s working great for you! I’d probably still tinker with the grind and weight until you find that sweet spot where the extraction starts to become slow or drippy. If you’re a double shot guy, perhaps dial it the grind and weight with the Barista kit. Extracting with a double shot might be a little more taxing on the unit. Also, thanks for the coconut water suggestion, I’m definitely going to give it a try! Thanks Simon! I’m using the Barrista Kit, works the same. Extremely tamped, (presumably) “fine” grind on the 1Presso Mini Grinder, and a steady, lovely stream. While we may be satisfied, it’s never fully satisfied, is it? Good suggestion to tinker with grind until approaching the edge of drip-drip/bitter-slow extraction is reached. Then either configure that special ‘spot’ varying tamping and/or grind. And, I imagine, removing/replacing the pressure piece. Grinder question? I keep hearing the grinder is even more important to the end result- especially espresso- than the brewing tool-method. Price spread is enormous, even with portable grinders, from less than $10 to $250. Speaking of “sweet spots”, where along this continuum to invest is a question. Reviewers almost always concentrate on virtually the same half dozen ‘premium’ grinders in the middle- from $35 to just over $100. I note you use everyone’s favorite, the tried and true, Hario Mini, which some reviewers choose to snub in deference to one 2-3 times the price. Do they know what they’re talking about? Why not do a grinder review? I’m sure it would be much appreciated. As a confirmed revisionist, I made the iconoclast’s choice for a 1Presso Mini (“Q” model)- a Taiwanese “copy” of the much more expense Helor 101. Seems to be great quality. However, neither the manufacturer nor reviewers think either the 1Presso Mini or the Hario (any model) can make “real” espresso. You think? (Amazon, because of unintended false advertising, is replacing the 1Presso Mini with an externally adjustable, $100 more expensive model. Nice of them.). Anyway, keep the reviews coming, your Lab in the picture and the soft touch humor on full. Congratulations. The nanopresso seems to be the best portable product for expresso. Thinking of getting a gift for a friend. For someone who prefers latte/mocha/cappuccino type of drinks more than expresso, would you suggest the staresso instead, for versatility? Looking for something that something versatile and compatible with coffee capsules. I just found your site today and have been enjoying your detailed reviews! Thanks for all your hard work on these. My husband and I just started our foray into the portable espresso world starting in June of this year. At home we use a Rancilio but when camping we had always used a Mokapot type device. Since we’re really into good espresso, I surprised my husband this year with a Wacaco Minipresso GR for our camping trip. It made respectable espresso and we were really pleased. However, after 3 months/30 espresso pulls, it started spewing water out the pump handle. Trying to get a replacement has been more trouble than it ought to be. Anyway, this got me hunting for a new device which lead me to this site. Hi, I’m in the search for portable espresso machine, and I fell onto your reviews which are fantastic! very good job! 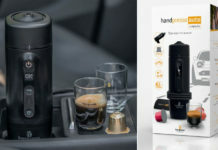 I’m between Handpresso Auto Portable (for the ease of boiling water together with the mini compressor and the use of ese pods it has) and the nanopresso portable. in terms of taste and quality of the espresso what would you propose? thanks! I’m a huge fan of the Nanopresso, I use it every day. I use it with the Barista kit (double shot) as the Handpresso Auto only offers a single shot and that just doesn’t seem to be enough for me. If, however, you’re happy with a single shot espresso the Handpresso and Handpresso auto do a great job. I personally favour the ESE pods over Nespresso pods for flavour but neither of them are a patch on freshly ground beans. Hi Simon. Thanks for your reviews – you are by far my favourite you tube reviewer and I love the outdoor sessions! I’m struggling to get results using the barrista kit to pull double shots. I’ve experimented with it in pressurized and non-pressurized modes; different grinds (from espresso fine to quite coarse) and different tamps. But in all cases the pressure builds up too high and the shot won’t pull (the piston is really, really hard to pump and coffee dribbles out very slowly if at all). Do you have any suggestions? Hi Mark, The first thing I’d have suggested would be to adjust the grind and tamp, but as you’ve already done that then I’d suggest dropping the weight down a little. I use 16g 95% of the time with a moderate tamp without any problems. Different beans seem to fill the basket differently for some reason. When I treat myself to the beans from Square Mile coffee roasters I can comfortably fit 17g in the basket, but when I use a shop bought coffee 16g seems to take up more space. I’d give 15.5g a try and see if that helps. If you reduce the weight down and the grind is not too fine and it’s still hard to pump and dribbling, then I’d guess there is some issue with the pump. Try running it under a cold tap and pump the piston fast for a minute or two. You could also switch back to the single shot basket and check to see if it’s hard to pump too, this might identify if it’s a pump issue or something to do with the preparation. I agree with Mark, Simon. You’re a natural in many ways. Also the best reviewer I’ve seen on YouTube. Teaching, and presenting the material intelligently, but with subtle good humor. The outdoor sessions and your lab who- like all pets- reflects who we are. Now… don’t get a swelled head! Have you tried the small Cafflano espresso maker? Hard to find, also hard to find reviews. Just wondering. BTW, re: the Nanopresso, can you clarify your reference to brewing with and without “pressure”, something about a small plastic bit that can be removed (which small plastic bit…?) for, I”m not sure what. I’ve no experience with the Nanopresso, but about to order one. Thanks! Hi Bob, I think I just replied to your comment on YouTube but here is the link to the part on my video where I remove the piece from the portafilter – https://youtu.be/GOLk1scDTcM?t=157 – Hope that helps. The link from your review of the use of nespresso pods, cleared it up. Apologies, I hadn’t seen Part III. In exchange, may I offer a small ‘tip’? Well, it’s something we like, especially since there are 100 coconut trees in our front yard. Instead of water we use fresh coconut water to brew espresso. Analogous to the cherry taste of coffee fruit right off the tree, coconut water tends to open the bean up to a more ‘whole’, fruity flavor. We haven’t tried packaged coconut water, but it’s worth a try. I really enjoy your blogg. According to your evualation, I brought the nanopresso. It’s nice to look at and easy to use (but not really thumb-friendy). Unfortunately, the espresso that came out was everytime too bitter and had a bad taste, although I tried différend grind. Do you have a idea what the problem could be.With my normal espressomachine and the bialetti, the coffee is much more better. No comparison! But maybe you can give me some good advices to change it and give the nanopresso a last chance. 2. It may be that you’re extracting too much water (A Lungo) If you’re making a single shot, try to make your drink about 30g, if it’s a double shot (with the Barista Kit) Try for around 50g. Then add additional water if you’d like it less strong. If it takes too long to extract, or there’s too much water, the finished drink will have more of a bitter flavour. – Hope that helps, have a great day! Thank you for a great review. I’ve only recently started learning about espresso and making the perfect shot. Thanks to your review I bought my espresso a week ago and have been very happy with the results. I bought the whole kit with the ns adapter and barista kit. From what I’ve read, a single espresso is made with 7g of coffee in 20 to 30’seconds making 30g of espresso. I can do this quite easily with 30 pumps. However when doing the double shot, using the same grind size, to get the 60g out of espresso it takes allot more time and pumps. Does this mean that is have to make my grind much more course to get it out in the 20 to30 second time? Do all your shots extract in that same time range? Sorry to ask the same thing you’ve been asked a couple of times, but was wondering if it’s happened to yourself where it’s taken a while to fix. I lost pressure when going through my normal routine of putting through a hot cycle first. Water was slowly dripping out and the pump had little resistance. It’s happened a couple of times where I fix it by pumping it under cold water to rid any obstructions, and it gets back working. This time however the problem just hasn’t gone away. I’ve tried it a few times with a couple hours in between and it’s the exact same. I’ve contacted Wacaco so I’ll see what they say. Have you had this happen where it took a while to fix? At home i brew morning coffee with my Moccamaster and sometimes i use our Nespresso machine. Thinking that i sometimes would like to have regular coffee maybe i should opt for the Aeropress, but with the barista kit one could maybe make an Americano? The Naonpresso to me looks fare nicer than an Aeropress. Hi Peter, Thank you for leaving a comment. I have been a huge fan of the Aeropress for many years, it makes a really really good coffee. When I originally got the Nanopresso it was with the single basket so if I were planning on making a Cappuccino, Latte or Americano I was still using the Aeropress for those. Since I got the Barista kit for the Nanopresso, I haven’t used the Aeropress once. My favourite drink is a black Americano and the Nanopresso with the double shot adapter if perfect for the job. If you’re on a budget, the Aeropress would be a good choice, but if you can afford to treat yourself to a Nanopresso with the Barista kit bundle I think that’s the better option. I will definitely go for the Nanopresso.Think i will go all in and also take the Nespresso adapter for conveniance. Wise man! The NS adapter is a great option for simplicity, If I’m making a coffee for a friend or family member, I usually just grab a pod instead of preparing the basket. Have a great day! I have a question about what size of ground coffe you can have the nanopreso. I sit possible to go with larger grind, like for aeropress size or regular coffe machine? thinking if it is worth experimenting around, sometimes for conveniance (at work) one could take regular coffee(for filter coffe) with the barista adapter to make a cup of regular coffe? And also, could you direct me to where (if you have made one) for a video or written steps on how to make your portable little kitchen for heating water outdoors. Some ‘espresso grinds’ are a little on the fine side. Costa for example to a pre-ground espresso that’s a little too fine for the Nanopresso. They also do a filter grind that works really well. The Lavazza espresso grind is fine to use I believe. If you have a pre-ground that’s a little on the fine side and it causes the Nanopresso to choke up, you could try putting a little less grinds in and tamp a little less, then it might work just right. Alternatively, if the pre-ground is too course, just tamp it a little harder than you usually would and it should slow the extraction down. As for the ‘how to make an outdoor stove’ you are the 4th person to have asked, so I definitely make a little video to demonstrate it. Keep an eye out for it in the next few weeks on the YouTube channel. Have a great day! Hi Erland, Sorry, I’m not sure what you mean ‘A Little smooth stuck’ could you explain it again please and I’ll be happy to help. I recently received my Nanopresso via Amazon, and I am in the process of learning to extract the best shot I can. I own a burr grinder (Breville Grinder Pro) but I still haven’t found a suitable roaster from whom to purchase my freshly roasted coffee beans. Due to the aforementioned, I have been using Illy’s Espresso Dark Roast Ground coffee. The beans seem to be pretty finely ground; however, I am finding it pretty difficulty to obtain a steady stream during extraction. I use 16 grams of coffee and tamp a few times while loading coffee into basket (not very hard, just enough to level out the coffee), and I still seem to be choking the system. At best, I am able to get the system to produce steady drops when I apply heavy pressure to the pump. I know I’m not over-tamping, and the preground coffee is specifically ground for espresso, so I’m not sure what the problem could be. Also, each time I have produced a shot, I have obtained a decent crema, but the shot itself has been relatively bitter. I am assuming the latter is the result of over extraction as it is taking well over 25-30 seconds to produce 50 ml for a double shot. Any advice you could send my way would be greatly appreciated. Some pre-grounds espresso blends are a little bit too fine for the Nanopresso. I got a bag of Costa grinds and they were a little on the fine side. It’s been a while since I bought pre-ground but if I remember correctly the Lavazza espresso is ground just right. If you really want to persist with the Illy ground coffee you could either try adding 15g instead of 16g that might help. You’ll notice that the portafilter does actually tamp the coffee deeper once it’s screwed on tightly (it sort of self tamps) So by having a gram less, it may just improve the flow. You could also remove the small silicone piece from the spring in the portafilter (non-pressurized mode) this will also help. I’ve got some amazing coffee beans right now from a company called Square Mile, but they are not cheap, so I also use shop brought Lavazza espresso whole beans and grind them myself with my Hario mill. I aim for a consistent flow which is about half the thickness of a matchstick. If it drips, you probably need to make your grind slightly coarser otherwise it’s likely to over-extract. Hope that helps. Hi Simon, I love the review and decided to get one. Simply couldn’t resist. I have only been using it perhaps for about 3 weeks now? The pressure seems to have disappeared, I need to do your technique of loosening the portafilter –> pumping –> tightening the portafilter and it works just like before. I tried running cold water through it however it doesn’t seem to improve. (The orange thing does move up and down like you said though). Do i run it under a tap and pump? Or do i fill the mid section with a bit of water (the section where the orange cross is) and pump the water through? Also when i do that, not much water is coming out the other side it is very slow is that normal? Sorry for the slow reply. This problem has happened a few times now over the last 6 months, so it’s unfortunate that you’ve encountered it within only a few week. I’m 99% sure it has something to do with a blockage in the pumping system. My kettle is terrible for limescale, I use a tea strainer most of the time, but it still makes its way through. If you take the body and flip it upside down and fill the back up with water (where the orange cross-shaped pin is) It should take around 6-7 pumps to empty it. When my unit loses pressure, it takes around 20-25 pumps. I hold it directly under a running tap (flow over the orange pin) and I just keep pumping. Eventually, you’ll feel a resistance return. Then if you count how many pumps it takes to drain the rear it should be back to around 7 pumps. If it just doesn’t improve, then you can either use my hack (loosening the portafilter and retightening it) and hope that the blockage will eventually work free, or get in touch with Wacaco, it will definitely still be under warranty. Hope that helps. Hey there, anyone getting leaks around where the adaptor ring seams against the nanopresso body and the nanopresso head? I get small droplets of coffee seeping out when I make a double shot coffee. Any advice as I currently just get coffee all over my hands whenever I make one..
Hi Christopher, I sometimes get the same issue, It didnt happen in the single shot setup, even when the portafilter was loosly tightened. 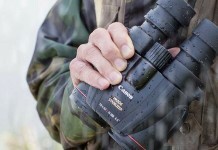 With the double shot adapter, it’s important to tighten it up more than you would normally. Before I begin my extraction, I just give it a little extra tighten, this usually prevents any dripping. It also helps if you don’t pump it too fast, I aim for a steady flow that’s slightly thinner than the thickness of a match stick. Hope that helps. Are any of you guys having difficulty with making a second coffee on the nanopresso? I use the barista kit to make two double espressos for me and the missus. The first always works perfectly, but the second (even though the grind and tamp pressure and technique are the same between the two filter baskets) simply doesn’t pump out easily. Funny thing is, if I wait a while, then the ‘first’ coffee is always perfect, it’s only the ‘second’. So i’m assuming the valves have expanded due to the heat or something? Anyone else had this experience? I sent them an email about it, but no response yet. I’ve had a few occasions when my second espresso seemed to extract differently from the first. I assumed it was from having some residue in the portafilter from the previous basket. There is a release valve inside the system that kicks in when the pressure goes over 18 Bar, maybe this valve is opening on the second pour for some reason. I haven’t experienced this problem recently, even though I often make two consecutive quite often, this may be because I do a little flush of the pump under the tap between extractions. I do this because I had a small issue due to limescale getting into the pump. I simply take the main body and place it under a running tap, I then pump it about a dozen times to push clean water through the valves. Since I started doing that, I have had an awkward second extraction, so maybe give that a try. Have a great day. In the Barista Kit it says to remove the black silicon part inside the spring for best results. It doesn’t say why this would give the best results. Any idea what this is and why it’s best to remove it? Hi Micheal, when you remove the black silicone part it makes the portafilter nozzle unpressurized. I have had it this way for the last two weeks now. In all honesty there is no difference in the taste, unless you’ve made your grind slightly finer. I’ve found that I can take my Hario Mill one click more on the grind. This will help produce a slighly less bitter espresso. If you keep the grind the same, the only difference would be the amount of air in the crema. With the part in, the crema will be bigger due to more air bubbles inside it. Without the part, the crema will be smoother in appearance and not quite as big. Hope that helps, have a great day. Ah ok I’ve got you. I tried it this morning in un-pressurized mode with a finer grind but I’m pretty sure I tamped it way too hard as it required a lot of force to come out, and did so in drips. got a couple more coffees left for the day so I’ll get it fine tuned. Thanks for the help Simon! Hi Simon – I’d decided on the Nanopresso based on your reviews, especially as I was also interested in getting the Barista Kit, which I did a month ago for both. First-rate espresso with excellent crema! Have used it, on average, about 3-4 times a week for a month (I like espresso, but not everyday) and have been meticulous about cleaning it of grounds between extractions and regular cleaning each week. Has your own Nanopresso stopped creating any pressure at all yet? After a month, mine has stopped creating pressure. Deeply disappointed. Obviously, I’m not attributing the fault with you at all as I feel I can trust your thoughts/reviews on a failing Nanopresso. If yours is still pumping well, then that’s great. If not, then I was hoping you’d comment on this or create a video if it should ever happen to yours. Hope not, though. Happy holidays! The timing of this question is perfect and I might be able to help you out here regarding your issue. I’ve been using the Nanopresso for over 5 months now, I’d say I’ve made close to 500 espressos in that time and never experienced any issue with loss of pressure. That was until last week (over the Christmas period) I was making family members drinks and during that time I noticed that the initial pumps required to begin the extraction were increasing. Eventually, it got to a point where I could pump and pump and it just would no longer extract. I toyed with the unit and discovered that if I loosened the portafilter after I’d pumped for a while, then tightened it back up, it would begin building pressure and extracting as it always did. This additional step was not ideal but did allow me to continue using the Nanopresso as I had before. Just yesterday I contacted the guys at Wacaco to ask them if they could suggest a reason for this and together we went through a fault diagnosis. During that time I was asked to take just the main body and place it under the tap and start pumping. I was then asked to look at a small orange cross-shaped pin and see if there was movement. There was, (about 1mm of travel) The water was also making its way through the device. While I was pumping cold water directly through the unit, I could see a noticeable improvement in its efficiency. When I put the portafilter, basket and tank back on and pumped it as a complete unit, it worked flawlessly once again without any need to release the pressure from the portafilter. I am pretty sure that what had happened was no more than a partial block in one of the pump valves most likely caused by small amounts of limescale from my kettle. The process of pumping water directly from the tap has flushed whatever was there through and it’s now back to 100%. So, my advice is to take a look at the small orange cross on the underside (while it’s under the tap) and make sure that it’s moving during pumping, if it is, just keep pumping the water through and hopefully your unit will flush whatever is in there though. If that doesn’t work, I highly recommend you contact Wacaco, they are a great bunch of guys and I’m sure if there is a mechanical fault, they will definitely replace the unit. ps. Please let me know if this worked for you. Many thanks, Simon. For whatever reason, checking that the orange cross-thingy got “pushed out” by about 1 mm while pumping water (without the portafilter or tank) did the trick. If a bit of limescale is the issue, I wonder if a periodic deep cleaning using a non-toxic de-scaler is needed. And here’s to perfect timing on your response… we can enjoy espressos on New Year’s Eve. To you and yours! I’m so pleased it worked for you! I’ve been pumping fresh water directly from the tap when I clean out the unit, I think that extra process might be enough on its own to keep the system healthy. If not, I’ll look into a non-toxic descaler. Have a great new year and thank you for taking the time to respond. Great review of the Nanopresso. Which portable espresso machine would you recommend for performance and portability? Definitely the Nanopresso, it’s the smallest and the lightest if all the espresso machines I’ve tested. If you don’t mind not having a Crema and want an even lighter option, take a look at the Aeropress. It’s not an espresso machine but it does make insanely good coffee. If I’m doing a big hike and want the absolute minimum weight, I’ll take the Aeropress. Thanks for your review! How would you say the nanopresso compares to handpresso and staresso in terms of the results? So sorry for the late reply, I can get a great quality coffee from both the Staresso and the Handpresso. You don’t have much control over the Handpresso regarding the pressure, you press the button and it just releases the pressure on its own. So the consistency is there, however, I’ve never been able to improve the crema, also the water capacity is also on the small side. You have more control over the results with the Staresso, once you’ve used it for a while, you’ll learn the perfect amount of pressure and speed to get a great espresso out, it’s like muscle memory. The same goes for the Nanopresso, which in my opinion is a far better product, the pressure and the pump mechanism is way better than the staresso. I know it’s a little more expensive than the Staresso, but I think it’s well worth it. Thank you for the review, I subbed to your YouTube channel, the video was great. Looking forward to seeing a demo of the Barista kit! Hi, Thanks to Simon for all these reviews of portable coffee makers. Desperately trying to choose a replacement for our my pressi twist* and you seem to be the only person systematically trying them all – so thanks! I had an email from wacaco yesterday that the accessories should be available from their website in the next week or so, so fingers crossed to be able to order them for delivery before Xmas! * The my pressi twist makes amazing coffee, but you can’t fly with the gas canisters so we can’t take it on holiday, and ours is starting to leak gas pressure after many years of good service and I don’t have the patience to disassemble it and replace all the o-rings. But it does match our Gaggia kitchen machine for quality of espresso and makes a double shot fine. If you can find one its worth trying!